The reliable dark skinned plum has a yellow, acidic flesh that is ideal for cooking. This cooking plum tree is self fertile and so will produce plenty of large round plums in early August. 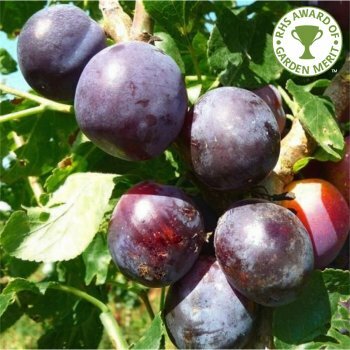 Plum Czar is a tough variety and so suited to less favourable sites and northern climates. It can produce very heavy crops and is always reliable. A fantastic, tasty plum ideal for pies, jams, bottling and more! Self fertile so only one tree required to produce fruit. Plum, Gage & Damson trees will not grow happily in a pot long term, they need to be planted in the ground. All other fruit trees can be container grown. Plum trees should be planted at a minimum of approx. 3m between each tree. Our pot grown Czar Plum trees can be planted at any time of the year, whereas bare root plum trees need to be planted between November and March. If you’re planting in spring, summer or dry weather, water well and regularly for the first few months. If you’re planting in autumn, you may only need to water your tree a little. Make sure to keep an eye on young plum trees and increase watering if there are extended periods of hot or dry weather. Once the fruit begins to swell, water again. Keep the area free of competing weeds and grass for the first few growing seasons.